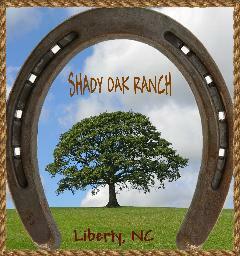 Shady Oak Ranch is a small breeding farm located in the Piedmont of North Carolina. Our small band includes Quarter Horses, one Paint and a couple of experimental crosses. Our focus is breeding quality Foundation Quarter Horses with reining and working ranch horse bloodlines. We currently stand a bay foundation Quarter Horse stallion. Our stallion is shown in person by appointment. All transactions are by private treaty. A private treaty is an agreement or contract between a buyer and a seller or between a stallion and a mare owner. The agreement is made directly between the parties involved, thus allowing them to tailor the terms of each sale or breeding. We offer general training and specific training for the sport of Cowboy Mounted Shooting.